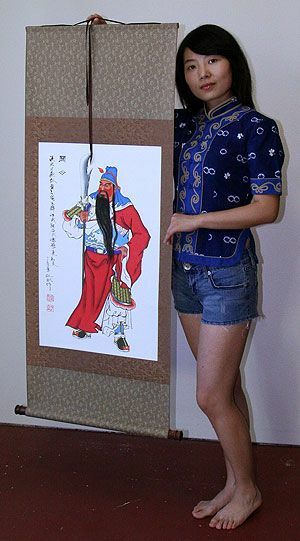 Artwork Panel: 52.2cm x 97.4cm ≈ 20½" x 38¼"
Silk/Brocade: 61.5cm x 153.9cm ≈ 24¼" x 60½"
This warrior's name is or Guan Gong (at least that is what his friends call him). 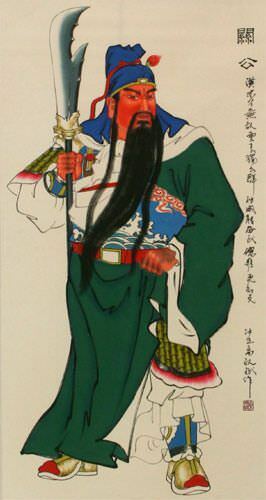 He was born with the name Guan Yu, but he earned the name "Gong" which is used to refer to a most respected person (You could also translate "Gong" as "Duke" in old English). Much as Confucius is seen in China as the Saint of Philosophy, Guan Gong is known as the Saint of War. He is known for not only for his status as a great warrior, but also being full of wisdom and knowledge. He is the essence of what Chinese people call or "yong" which means brave, courageous, and not afraid of difficulty. Note: Along with the title, date, and artist's signature, this artwork contains a Chinese poem of sorts about Guan Gong's high esteem and abilities in both civil and military matters.